As bad as the preseason has been for the Canucks, it seems to have paid off in spades for multiple prospects still on the roster and players that have been sent back to junior/AHL. 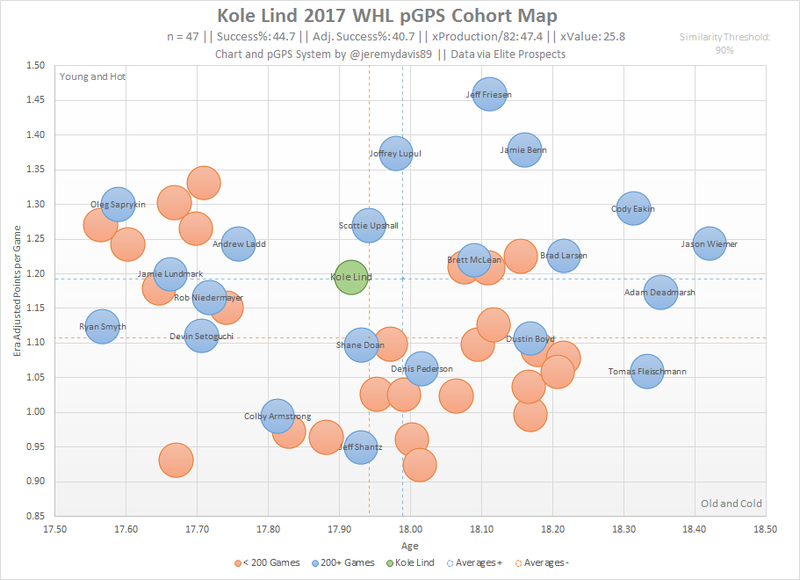 Case in point Kole Lind, 2017 2nd round Canucks pick (like you didn’t know). Lind was sent back just in time to join his Kelowna Rockets teammates before the first game of the WHL season. He didn’t need much time to adjust. Whatever the Canucks coaches taught him, he put into use right away. In the Rockets’ home opener on Friday, Lind made quick work of the Kamloops Blazers defense and eventually their goaltender, fellow 2017 draftee Dylan Ferguson. Torching the Kamloops Blazers doesn’t put Lind in MVP consideration quite yet but he was far and away the Rockets best player and after collecting 8 points through 2 games this weekend, he’ll be hungry each and every night. The Rockets are a very different looking team this season with Nick Merkley, Lucas Johansen and Calvin Thurkauf moving on, as well as the unknown fate of Dillon Dube at Flames camp. Kole Lind will be targeted as one of the top producers on his team this year but much like last season when he led the Rockets with 87 points, he’ll challenge for top spot again. Vancouver will be keeping a close eye on Lind this year with the current youth movement afoot, a monster season in Kelowna could push his stock way up to a potential roster spot next year on the Canucks. It will be interesting to compare gameplay with Boeser and Lind this year to see how they matchup in relation to their competition. Coach Jason Smith of the Rockets has Lind available in almost every game situation and that speaks well of his talents. When he does eventually turn pro, Kole will have a solid arsenal of weapons every time he steps on the ice and Travis Green will trust him with more than just 5v5 ice time. Jim Benning hit a home run with the 2017 2nd rounder and if Lind can hold up his end of the bargain there may be more future picks out of the Okanagan. We all know it’s been invisible until this past year. 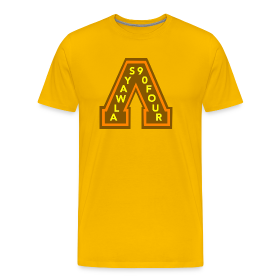 I created the Athletic Kelowna (which is in no way shape or form related to The Athletic). As you probably can tell, I spelled the headline wrong and because I am a parent of two young children I don’t have any time for your criticism on a simple spelling error. Maybe that’s why the REAL Athletic wasn’t looking for local representation outside of credentialled writers. It makes sense. Growing up in the Okanagan, I used to read the Daily Courier (local paper), The Province and even the Vancouver Sun on the weekend. I tracked box scores, signed up for hockey pools and clipped out the Family Circus in the funnies (Love that Jeffy and Billy). Those were simpler times. When the Internet was introduced those papers were still around but the years went on and the online offering for news grew more and more. The introduction of Facebook and eventually Twitter gave so many ACTUAL writers a wider reach to readers like myself and instant access to archives that only the public library would have. I don’t even have a library card. Come to think of it, I’ve only really ever parked there. I have some soul searching to do apparently. OK, back to my decision. Lebron got one and I hold myself to at least 1/100th of his talent but as a blogger. No one is broadcasting this, it’s on me. Starting on my own and being invited to write for the prestigious Canucks Army has been a wild ride and what better way to step it up a notch than to join a fictional, parody pay to read subscription based website? Coming up with a platform was tough. What would The Athletic Kelowna be about? Well, the real one is about real sports, real sports stories and the athletes they cover. This was going to be about how I hate bike lanes, how people don’t respect Nickelback and how blogging has evolved to the living room that only gets used for special occasions now that most moms rent out their basements now or even AirBnB. What a concept THAT is! There was also a few other names I spitballed: The Dad Bod Kelowna (somewhat similar to athletic), The AK (too gun-like), The White Sunglasses Roidrage Review, and The Ogopolo. The last one confused me too much and I’m not much for croquet on a horse or horses for that matter in general. Sports are my life and unfortunately, I couldn’t make this all work while I lived in the Lower Mainland as I’m sure things potentially could have gone differently. This new venture will elevate local blogger(s) to the secondary news level which is just below real news but not quite unpaid guest work for sites you can create on your lunch break. But I’m in Kelowna again, putting my spin on the Kelowna Rockets, writing about the Canucks from just up the Coquihalla and enjoying raising my girls in Canada’s best playground: the Okanagan. The Athletic Kelowna never really was created; I barely get 100 views per article when I DO write, the site would shut down in a week. I will say that I am disappointed The Athletic doesn’t see me as the future of sports media but my demands are pretty high and I doubt they have a budget for Frappuccinos and Baconators. For now, just read Always90four and Canucks Army. Before this series started, many would have seen the Kelowna Rockets and Seattle Thunderbirds extending the matchup to seven games. Well, it’s Game Six so Kelowna will need to put some pucks in the net if they want to book another bus trip to Kent, Washington on Tuesday. Seattle took Game Five in somewhat convincing fashion after the Rockets couldn’t capitalize on their own power play chances and let the T-Birds execute on theirs. Expect more of the same tonight. The series has been pretty even with both teams splitting games in each city but it was the Thunderbirds that took the extra home game back on Friday to put their team ahead 3 games to 2. The power play has been hot for Seattle this post-season and they currently hold the top-ranked unit by a whopping 4.2% over the next closest, now eliminated Red Deer Rebels, at 37.5%. The Rockets are trailing in that category by about 10% and in the playoffs, that’s huge. Sticking with special teams, Kelowna leads the WHL playoffs with 216 PIM and if they continue that trend this evening, it will be hard for Jason Smith’s team to force a seventh game. Mid-season addition, Carson Twarysnki, hasn’t scored since April 12 when he had one of Kelowna’s seven goals against the Portland Winterhawks. With Seattle bringing a physical game each and every night, T-Dub will need to get back to the dirty areas and power his way to a few chances. Twarynski was great in the first two rounds but has been quiet in the Western Final. Kelowna will need his contributions if they are going to advance. Nick Merkley has been a light show in his last 11 games putting points up in 10 of them. His stat line is a dream with 6 goals and 11 assists in that time. Merkley is the Rocket’s all-time leader in playoff production and when he’s on his game, he’s the catalyst on the team. Suffering a freak ACL tear last year, Nick has rebounded well and has brought renewed hope to both his current WHL team and the Arizona Coyotes who drafted him 30th overall in 2015. Providing Kelowna can stay out of the box and play a disciplined game, they should be able to stay ahead of the red-hot Thunderbird squad. Kelowna has averaged 35 shots against Seattle this series so the opportunity is there to strike. Keegan Kolesar, Ryan Gropp, and Alexander True all have three goals against Kelowna so keeping them in check will no doubt be on the gameplan. Don’t expect a blowout this evening but considering this series has been played down a man on either side, someone is due to open it up. Let’s all hope the Rockets send their fans home awaiting the AM1150 call on Tuesday night. If anyone actually thought the first round for the Kelowna Rockets was going to be a cake walk, they have a serious case of amnesia. The Blazers bested the Rockets 6-4 in the regular season but as it came to a close, the Rockets reminded Kamloops who has been in charge the last two seasons. Game 6 will be a tight-knit affair and ultimately, the first goal may just decide who is victorious. Kelowna set the tone in Game 1 and 2 but the Blazers brought the fight back in Game 3 and 5. We haven’t seen a flurry of goals but the first one seems to be really important. Jason Smith’s club has been Jekyll and Hyde so far in the first round and it would be wise to bring the Game 1 sticks with them on the trip to Kamloops this evening. The trip to Kamloops for Game 3 put Kelowna at a disadvantage when the Blazers opened up their own scoring clinic with 4 goals of their own. Kelowna will need big games from their stars which may be easier said than done. 2017 Draft hopeful, Kole Lind, has one goal in the series after leading the Rockets in regular season scoring. Veteran forward Nick Merkley has been quiet on the scoresheet as well with a lone assist to his name. The beast Calvin Thurkauf has a few assists but even though he has tried to break out, the Blazers have kept him in check and it’s a big reason the Rockets didn’t run away with the series. The City of Rockets has put up a ton of points this season but the population has dwindled as the series has drawn on. Captain Rodney Southam needs to spark his team tonight and help set the tone for what will be no doubt, a stingy game. Thankfully, of all the players on the Rockets, goalie Michael Herringer has done his job and then some. Through 5 games, Herringer has 2 shutouts and has posted a .931 save percentage. It’s been nutty in the Kelowna end of the rink but he’s been Joe Cool. I’m sure Herringer is happy his teammates have done their best to create scoring chances by peppering Blazers’ goalie Connor Ingram with a whopping 205 shots! Whatever Kelowna did in their three wins so far needs to be replicated and drowned in energy drinks if they want to emerge victorious tonight. Tomas Soustal has looked great to start the series but his efforts will need to be visible as Kamloops isn’t giving up without a fight. He had a great charge in Game 1 and Blazers’ forward Jermaine Loewen has taken over as the visible force after that. Both of these teams realize how important this series is and the long rivalry between Kelowna and Kamloops has once again been amped up. Don’t turn away after the opening puck drop because you’ll be sure to miss a big play that everyone will be talking about tomorrow. Bruce Hamilton brought in veterans Carsen Twarynski and Reid Gardiner to put Kelowna over the edge once again and they have done their part so far, it’s the familiar names that need to step their game up and capitalize on the numerous chances they’ve had and take the goal mouth scrambles and turn them into leads on the scoreboard. For Dr. Jekyll, err… the Rockets to finish off the series, the power play must be the difference maker. Both teams have been awful at converting with 15.8 and 3.6% for Kelowna and Kamloops, respectively. The setup has been perfect but they’ll have to find Ingram’s weakness because he’s seeing everything. It’s the Rockets and Blazers for hopefully the final time this season. Almost a year ago, Nick Merkley was dealt a pretty devastating blow after being drafted by the Arizona Coyotes that past June and then tearing his ACL in February in a game against the Spokane Chiefs. It was the kind of injury that couldn’t have come at a worse time as his team was gearing up for another run in the playoffs and having been drafted, it was a chance to show what he could be to the Coyotes. Life throws some interesting curves. Fast forward to this year and Merkley’s rehab from his injury was slow going. He was getting the proper conditioning and treatment down in Arizona and when it was time to come back to Kelowna, everyone felt he was good to go. The thing is, ACL’s don’t just “heal”. It’s a pretty significant injury that can affect how a player in any sport reacts going forward. Unless you happen to be Adrian Peterson of the Minnesota Vikings (a superhuman, basically) you probably will have a longer healing period to get back to the point you were producing, if at all. Upon returning to Kelowna, Merkley had a slow start which should have been expected. In his first 10 games this season, Nick racked up a paltry goal and 4 assists, with his first goal coming in his 10th game back. Including that 10th game, Merkley went on to score 6 times and added 2 assists in his next 6 games. It wasn’t just the production on the score sheet, but the way in which he got back to what he did best. Merkley fought the puck a lot to start the year and it was pretty visible that his frustration caused him to clinch the stick a bit tighter and get away from the thinking game he dominated so much. You no doubt have heard me sing his praises since his rookie campaign, and for good reason: he’s amazingly talented. As this season has gone forward, Nick has put the team on his back many nights and just when opponents tried to get on his, he brought “the swivel” back into his game and quite frankly, there aren’t many players that I’ve watched in any league that can execute that shake like he can. Maybe not one of his best, but the success rate he has with that move is almost 100%. Watching Merkley perfect the little things is what excites me the most, his shot seems to be more on point and his passing game is once again becoming a strong suit. He still is a little choosy when dishing the puck but he rarely disappoints when the puck hits his team mate’s stick, maybe you’ve seen this one already? Despite the losses his Kelowna Rockets team has endured lately, Merkley has put up 8 points in his last 10 and with rookie Nolan Foote being out for an extended amount of time, Dillon Dube, Tomas Soustal and Calvin Thurkauf being away at the World Juniors and now Kole Lind and Cal Foote strutting their stuff at the Top Prospects Game, there have been many nights where Merkley has had to step up and represent the “A” on his shoulder. Many of these players have been getting more publicity in the media lately as they have their own stories to be told but Nick has been evermore the continual beast on the ice and looks to prove his doubters wrong (if there are even any) that an ACL can’t hold him back. His late first round spot also serves as a chip to show the rest of the NHL what they are missing out on. In his rookie season, I stated he had the hockey mind of Wayne Gretzky. Super, bold statement, I know. I am not comparing the two as equals as a whole and there will definitely be someone that will want to destroy me for even uttering those words but watching him think out the game in real-time is amazing to watch. You can tell he knows where the puck will end up because either he’s there shooting it or another Rocket has the puck creating a scoring chance off his pass. It’s a shame that Nick wasn’t able to showcase himself at the World Junior tournament the last two years but it only serves to motivate him in his quest to be an NHLer. Breaking down his distribution of points, of his 22 assists this year, Merkley’s has 18 primary assists, 1 back of first on the team. He accounts for 7.87% of the Kelowna Rockets’ total team points which ranks 4th on the team and his percentage of total goals created is 4th with 21.94%. As far as the power play goes, 75% of his goals are produced on the man advantage, which is tops on the Rockets this season. Shame to see him out of the lineup, although with the staggering amount of penalties the Rockets take, 812 total PIM and 16.2 PIM/GM (both tops in the WHL), the power play isn’t exactly out that much. No longer having Rourke Chartier as his linemate, Merkley’s rediscovered how to be self-sufficient and at the same time put his stick in a position to help the rest of his team out. Having Thurkauf on his line is a treat as they just know how to feed off of each other. The open ice hits have come back as well to Merk’s arsenal and he’s proving he isn’t a one-trick pony. Kelowna will have to get their problems figured out if they’re going to have any kind of success this postseason and Nick Merkley will once again be a major reason they achieve extended success. Surgery hasn’t silenced Merkley, in fact, it’s awoken the beast. This isn’t exactly one of the Rockets storied seasons where they lead the WHL in points, have multiple players challenging for the scoring title or a goalie that hasn’t let in a goal since Christmas; but they have a few players that could be the next superstars in the NHL come June. The ISS rankings from January 4th have Callen Foote at 8th overall and Kole Lind at 28th. Two Kelowna Rockets in the first round of the NHL Entry Draft? Things just got interesting. 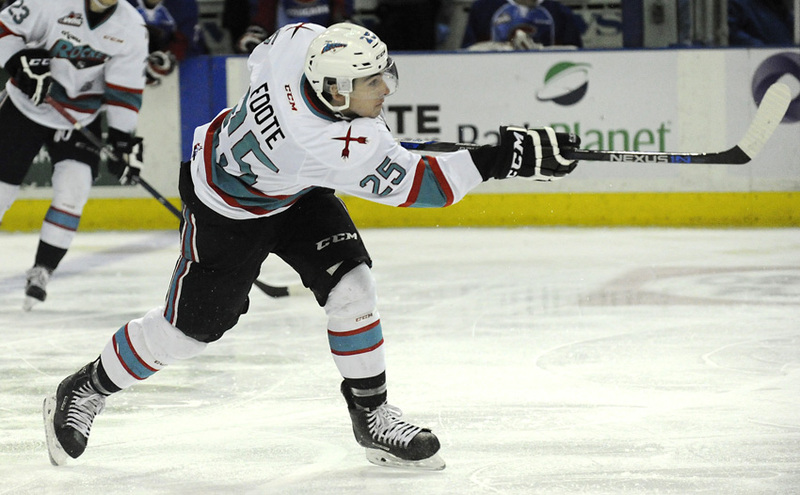 The family lineage of Cal Foote makes it easy for him to get noticed, son of Stanley Cup defenseman Adam Foote, but his play on the ice speaks for itself. He’s a rock on the back end for Kelowna, he’s smart in his own zone and has great catch-up speed. Although, he isn’t leading the league in any categories, he is one of the leaders on Kelowna’s blue line. His shot on the power play gets noticed and it’s hard to see a game where he hasn’t been part of the main story. Rockets defensemen are well known around the NHL as puck movers, impact players and for a handful of them, surefire cornerstone pieces to building a Championship. Stars like Madison Bowey, Shea Weber, Damon Severson, Josh Gorges and Duncan Keith all had great starts in Kelowna and carried their mantle to the NHL. Not all of those players have hit it big but it’s only a matter of time. With 48% of his comparables going on to play 200+ games in the NHL, there is a very good chance Foote sticks and becomes a solid contributor in the NHL. There are also lots of WHL comparables which just shows how great the Western league is at producing blue line stars. Notables on the list here include Brent Seabrook, Shea Weber, Luke Schenn and Jay Bouwmeester; all of which have made their mark in the NHL. Predicting an average point total of 28.3 per season, Cal can be an everyday defender that NHL teams can rely on. Obviously, these are based on a prediction based model and real life stats could easily exceed this number but for NHL teams looking at Foote, he’s a safe pick with a potentially huge upside. Based on the graph, Foote would average around 0.72 points/gm and again, that’s a pretty high bar. Considering Shea Weber is averaging 0.58/gm in his career, I take that from Foote all day long. That part I’m sticking on the name he holds and the Kelowna Rockets program he has been brought up in. 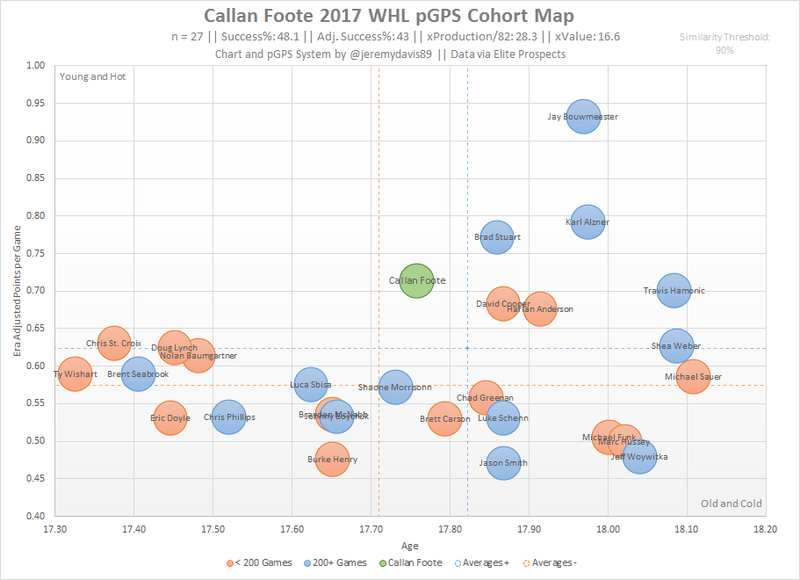 I could see Cal Foote developing into a can’t miss defenseman that teams can build around. His younger brother Nolan will have some big shoes to fill. Up front, Kole Lind is putting together a draft campaign that hasn’t normally gone well for Rockets forwards. As amazing as teammate Nick Merkley was in his draft year, the Arizona Coyotes were allowed to pick him with the last pick in the first round when many thought he’d be taken in the early 20’s. Lind is currently sitting in 17th in overall scoring in the WHL with 58 points and has 5 GWG. His recent explosion last week against the Portland Winterhawks tore the Hawks apart for 2 goals and 2 assists, dominating play and putting his name back in the spotlight for the Draft. Kole Lind hasn’t had a statistically dominant year but he has been a threat on the ice almost every shift. His play along the boards, his offensive awareness, and ability to stride down the wing has brought the fans to their feet 22 times this season and as the Rockets get closer to the playoffs, he’ll be a driving force on the score sheet. Looking at Lind’s pGPS graph, his comparables are pretty impressive as well. Lind’s 44.7% success rate comparables are all around the NHL. Jamie Benn would be the most notable player and surprise, surprise… he was a Rocket too! Joffrey Lupul has been around the block but has 701 games and 420 points speak for themselves. Journeyman Shane Doan is on that list and he’s darn near 80 years old! Captain Canada Ryan Smyth is also a solid comparable and if Kole Lind pans out to be anything like either of those two players, he’ll have a heck of a career. Lind’s projected production over 82 games sits at 47.4 points a season which is quite alright. Not in the top line range but can float around in a top support role. If you take a look at former Blazer and hated opponent, Scottie Upshall, he sits right around where Lind is on the chart. Scrappy but productive and he’s made a name for himself in the NHL. Although Upshall has a career 0.39 pts/gm, he has been a thorn in many teams sides. Kole Lind will be looked at as a depth forward with a high offensive upside, unfortunately, a first round draft pick is where you want to draft your next stud. He has the weapons but it may take some time before he unleashes the true beast. Jamie Benn seems to have done just fine so if I’m Kole Lind, I wouldn’t worry about it. As the Draft approaches, expect to see players like Foote and Lind step their game up to boost their draft stock. The next chance they’ll get to publically show their talents is at the BMO Top Prospects Game in Quebec. This game can send many players up the ranks and get them more publicity as the playoffs carry on. One thing is for sure, the Kelowna Rockets have it figured out. The first question would be why are you picking two defensemen when the Canucks are pretty set at that position. No, no they’re not. Luca Sbisa can’t possibly be a long term solution so at some point he’ll be traded or if they happen to see it through, he’ll become a UFA. The Erik Gudbranson experiment feels like it won’t last very long and re-signing him would be a bad move. But then again, we still have Benning. I guess the other question would be: do you really think the Devils would trade their number one defenceman? But let’s get back to where the Canucks are sitting. Philip Larsen probably won’t play another game unless injuries keep taking defenders down. Alex Biega is just kind of sitting there and he’s been given a chance but just isn’t IT. Jordan Subban down in Utica feels permanent with this management group and with the list of guys ahead of him growing by the month, it seems harder and harder for Jordan to be a Canuck. Then we have the big group: Alex Edler, Ben Hutton, Chris Tanev and Troy Stecher. This is your core for now. Nikita Tryamkin could be #5 with some time and finesse. He’s actually having a decent year now that he has adjusted a bit more to the North American game. His strength and sheer physical dominance will eventually make him a threat on the back end for the Canucks. Adding a player like Damon Severson right away gives the Canucks a solid, young top 6. It’s entirely possible Edler or Tanev is moved if enough is going the other way or there is a big enough package that one has to go. If it’s me, I move Alex Edler in this case. Madison Bowey is intriguing because of the leadership, grit and passion for the game. He’s tied for 9th best in the AHL for defensemen points and is 5th on the Hershey Bears in scoring. He holds the line well, has a booming shot from the blue line and he isn’t afraid to dust it up. Bowey is still raw but putting him on a pair with Hutton or Stecher would be pretty fun to watch. If you like goals, you’d get that from Bowey. Tough to say what Washington sees in him at this point so he may still be a cheap enough chip to acquire. If the Canucks feel they have botched the Jake Virtanen situation as a whole (which they basically have thus far) and want to move on like they did with Cody Hodgson and Zack Kassian, Jake could be a good fit in DC. Obviously, it isn’t a 1:1 deal so Vancouver would be saying goodbye to a higher pick or possibly another top prospect. Bowey was taken in the 2nd round of the 2013 NHL Draft, the Canucks albeit did not have a pick that round and they would take Cole Cassels in round 3 but for a rock on the blue line which the Canucks are still trying to find, he’s going to be a sure thing. Coming within an OT goal in the 2015 Memorial Cup as Captain of the Rockets, he knows how to win… oh and he was pretty decent at the World Juniors too! Over to Damon Severson, it’s unlikely the Devils have any plans of getting rid of this guy. At 6’2, 205lbs, Severson is a mobile monster on the blue line. First of all, he plays for the Devils, second, he already has 3G and 9A this year; which I don’t want to remind you but that’s the same point total as Henrik Sedin who happens to be second in Canucks scoring. Taylor Hall is his only equal in points in the swamp. Adding to those 12 points is the 5 power play assists he has as well. The Canucks took Alexandre Mallet in the 2nd round of the 2012 NHL Draft where Severson went 3 picks later to almost end the round. Yes, there were decidedly better prospects and current NHLers after those guys (Gostisbehere, Vesey) but again, how do you not entertain taking a defenseman out of a program that churns all-star players at that position? Ridiculous. You know all the big names that have come out of the Kelowna Rockets system and believe you me, Damon Severson is quietly becoming the next big name. He was a steal in the 2nd round as far as I’m concerned and just like Shea Weber fell to the very, very lucky Nashville Predators, the Devils had to be excited they were able to get such a stud. Severson’s final campaign as a Rocket was a beauty, 15G 46A, 5PPG, 15PPA, 18 points in 14 playoff games, etc. You get the idea, he’s good. Moving what looks to be your top defenseman after only 3 seasons isn’t exactly smart but they have Cory Schneider and old Lou is long gone. Severson might be a long shot at best but for the sake of your reading pleasure, I put him in here. Is giving up on Jake Virtanen a good idea so early in his career? Is he the next Cam Neely? Who knows. I’m dreaming but Benning is crazy enough to make a trade like this work. There are a handful of guys that make sense in a meaningful trade from the Canucks and when you take emotion out of it, Alex Burrows and Jannik Hansen are decent pieces to move. Diving into the Comets for trade bait isn’t the smartest idea but on the back end, I think they can afford to move a few guys if necessary. Wait, do we even have anyone good down there? Up front, the spark plug that is Tyrell Goulbourne is worth kicking tires on. In his rookie season last year with Lehigh Valley, Goulbourne notched 7 goals and 10 assists, he combined that with a healthy 75 PIM. Not bad for a guy who had come off a lacerated calf in the spring during the WHL playoffs which ended his junior career. That fight is the one that stands out the most for me as I was at that game. The Rockets were getting beat early in that one and Goulbourne went for the biggest guy on the team, who also liked the rough stuff and absolutely dummied him. He was a fan favourite and always gave his team the edge when the game was close. The skill guys do their stuff but it’s the energy guys that fill the hard minutes to give the stars their space. Goulbourne is a blast to watch and having him as a Derek Dorsett replacement a few years from now or a more talented Aaron Volpatti in the day just works. There are guys like Raffi Torres and Maxim Lapierre that you need in a long run (whenever that happens again) and Goulbourne can be that guy. Right now, super cheap. I’m thinking Goulbourne could go for a Mike Zalewski, Jayson Megna or HEY! Joseph Labate. My good buddy over at Canucks Army, Jeremy Davis, gave me some great data for you to ponder on these 3 guys, well 2 mostly. His pGPS system is pretty cool and I asked him to get data on all 3 guys but Severson is already a full-time NHLer so he kind of drops out of this. Madison Bowey had a pGPS of 47.5%, matching 28 of 59 players that became NHLers playing over 200 games. Here’s the kicker: the matches averaging 32 points/82 games were Mike Green, Keith Yandle, Dennis Wideman and Christian Ehrhoff. Pretty decent company. If you can add a player like that for a low cost before they become that player, you should definitely be doing it. Tyrell Goulbourne had a 9.4% rating matching only 24 of 256 players. The players that did make it averaged 21 points/82 games. Curtis Glencross, Antoine Roussel, Chris Kelly, Vern Fiddler were the most successful matches. Mostly 3/4th liners and replacement level NHLers. I’m holding out for a guy like Goulbourne because even Vern Fiddler didn’t have what Tyrell did in his fists. Guys like these move around all the time before some GM finds his diamond. Jim Benning can actually do some good here by kicking tires on these players instead of the mess that is Evander Kane. I don’t expect the pinnacle of these 3, Damon Severson, to come cheap because you would basically be asking to have their top guy. See what would happen if Benning traded Tanev or Hutton (I’M NOT SAYING HE SHOULD, I’M JUST PROVING A POINT!) Regardless, they are all interesting options for a Canucks team that needs to get serious. Don’t forget, Brock Boeser will be a Canuck soon enough and that guy seems like the real deal.Plenty of goals will come off his stick. There are players that will instantly make the Canucks better that just need time. Thatcher Demko on the back end is earning his stripes and a few years from now he’ll be talked about all around the league. As Cole Cassels develops further, his opportunity will increase to make the team as well. Looking at the former Kelowna Rocket players, it’s evident they can be valuable editions to Vancouver and I believe the Canucks have moveable pieces and with the rebuild in progress, they’re young enough to be around for awhile. Remember when Edler was a rookie? Bieksa? HECK, Tanev? Time goes by pretty quickly so jumping on a hot prospect is a timely deal. As the hashtag goes, #itwas2tozero. Game 7 in Victoria’s barn was going to be hard enough but going down 2 buzz in the first? The Royals were too good to let this one slip away. That’s the beauty of playoff hockey, anything is possible. No matter how you enjoyed this one whether on WHL on Shaw or the electric play by play of Regan Bartel on AM 1150, it was a thriller right down to the last 0.2 seconds of regulation. Oh, and then there was overtime. Kelowna wasn’t as charged as they should have been in this game and aside from some luck and a few saves by Michael Herringer, the Rockets could have easily blown this one. Justin Kirkland added yet another playoff tally to his resume, it wasn’t pretty but it put the Rockets back in the game early in the third period, cutting the Royals lead to 1. Kelowna pushed back in the third period and had a few opportunities to pull even. A Ryan Gagnon delay of game penalty about 4 minutes into the final frame could have put Kelowna dead even but they just couldn’t capitalize. It was a nailbiter right to the end and when coach Brad Ralph pulled Michael Herringer with just over 2 minutes left in the game, the stress level went to Defcon 5. The Rockets just couldn’t get anything together and Victoria was able to get the puck and take a long shot at the open Kelowna net from the Victoria end. Off the outside of the post……icing. The Rockets and Royals held the puck in Victoria’s end boards for almost 30 seconds and if it DID stay there that long, the game would have ended and the Royals would have advanced. Anyone with a pulse was in utter shock; amazement if you’re a Kelowna fan and dumbfounded if you happen to cheer for the Royals. Overtime was back and forth but it was the Rockets who held the play. Maybe getting a buzzer beater is good for morale? I’m guessing yes. Even though there is not ONE Canadian NHL team in the Stanley Cup playoffs this year, the WHL is more than making up for that. The Rockets will face the Seattle Thunderbirds in the WHL Western Conference Final starting Friday and Saturday in Kelowna. I have a feeling this series will be just as intense as the last one. That’s Rockets hockey I guess? You saw Game 6 and even if you didn’t, the Kelowna Rockets would prefer you not see it. Penalty troubles plagued the Kelowna crew and a less than attentive start in the first period had the Rockets playing catchup all game. Heading back to Victoria for the illustrious GAME 7 is all the motivation the Rockets need. Get the job done and move on to Seattle. The Rockets have done quite well in the conference semis this year with every game being a tight knit one. Neither team is giving up much so the errors are front and centre when they happen. Stellar goaltending on both ends has forced everyone to bury their chances because there won’t be many opportunities to take a lead. Kelowna is 2-2 in Game 7’s going ALLLLL the way back to 2008. They don’t play very many of them but have seen a number of Game 6’s though. As you no doubt have heard, if Jack Walker scores for Victoria in this series, the Royals have won. Not a fun stat but he’s pretty good. It wouldn’t surprise me if he did indeed score but the Rockets have plenty of fight left and can put this away just as much as the Royals. STAY OUT OF THE PENALTY BOX!!! The Rockets have been shorthanded the MOST of any team in the WHL this post season, 60 times if you really wanna know. No doubt Brad Ralph has preached discipline but I mean, at this point, you just hope they outscore their problems. Maybe change it up and think about drawing penalties instead of taking them. On that same note, Victoria is finding it tough to score as Kelowna’s 85% PK is impressive. Lack of Power…play – The Royals have a 17% PP success rate which isn’t all that high but Kelowna isn’t really any better at 14.6%. Whoever wins this battle, probably wins the game and thus, the series. Rourke is off the Charts! – Rourke Chartier and Tomas Soustal lead the Rockets with 11 points; each with 5 goals and 6 assists. Charts has been an integral part of the Rockets success the last two seasons and without star Nick Merkley this time, he’s upped his game as have others and they’ve enjoyed energy bursts that usually result in scoring chances and more than not, goals. Another brick in the wall – Michael Herringer just doesn’t quit. He’s bit early on a few goals this series but other than that, nobody can beat this guy. He’s so cool in the net, he just doesn’t panic under any circumstance. His 2.38 GAA is tops among active goalies in the playoffs, his two shutouts, ditto. Herry’s .928 SA% is no slouch either and we shouldn’t be surprised. Herringer has been the Rockets MVP this playoff run because without him, they probably don’t even get passed Kamloops. Another big game should be in the cards for him. Win Game 7 – we all dream of winning it all in Game 7, scoring the big goal and the team carries you off. Tyson Baillie had a pretty impressive one against Seattle to finalize a hat trick so he knows the importance of bringing everything you have. Play the game that got you there and it should be just fine….well not Game 6. Brad Ralph might be interested in getting Riley Stadel a few more minutes for this one. His energy and versatility are almost unmatched and a big hit early could help steer the course in the Rockets favour; combine that with a Chartier/Kirkland goal and Kelowna is on to Round 3! We are very fortunate to have this series on Shaw so we can enjoy the tight knit hockey one more time I’d assume the East gets the next round so the Rockets will have to climb one more mountain to get their names in lights once again. But first, the Victoria Royals. It will be nail biting, it will be stressful and it will most definitely be must see TV. When this series started, I had the Royals winning in 7 games. As good as Kelowna has been this year, Victoria just seemed to have the IT factor, especially to close out the season. As the Rockets enter Game 6 on home ice, they have a chance to close it all out and prove to the CHL powers that be that rankings are nothing more than a number on paper. They may not have the Tyrell Goulbournes, Madison Boweys, Nick Merkleys or even Jackson Whistle but the veterans have stepped it up a notch this series and are getting results. Tyson Baillie hasn’t been the hot hand this post season but when you need a big goal, he’s your man. So maybe Baillie hasn’t been the guy but Justin Kirkland has brought his game to another level against the Royals. His big shot and offensive awareness have been game changers in the last 3 tilts. With 3 goals and an assist in the series, he’s getting the looks and making the most of his chances. His goal in Game 5 to make it 3-1 was a PP marker and at that point there was no turning back. Speaking of the power play, the Rockets sure waited to get this going but boy oh boy does it shine now. As Game 6 approaches, all eyes will once again be on Michael Herringer. He’s been as the kids say, “SICK”, and when he doesn’t make the called save, he seems to be having a bit of the puck luck as well. When you’re on your game, things just seem to go your way. Herringer gives the Rockets the ability to press a little harder at the other end knowing their goaltender can bail them out. Even when Herringer doesn’t make every save, he has Joe Gatenby to back him up. Gatenby has been a defensive gem in this series and keeping Joe Hicketts, Jack Walker and Logan Fisher off the score sheet has been a chore but he’s up to it. Yes, he’s been out there for a few but his overall game has built confidence in the Rockets end. The one line that might just take Kelowna all the way again has a familiar face and a few welcome additions. Rourke Chartier, Tomas Soustal and Calvin Thurkauf have been a delight. These guys love to score and Rockets fans are sure glad they do. A combined 5 goals and 10 assists in 6 games, the top line is surging and it won’t surprise anyone if they get the ball rolling again on Sunday. Its not just pucks going in the net, these 3 are making it look fun. The series isn’t over just yet but after Game 5, its tough to see the Rockets regressing in the series. After back to back wins on back to back nights, Kelowna found another gear and are making the Royals pay for any mistakes they make. Herringer is stopping everything in sight and the Rockets power play is starting to click. Victoria will need a perfect game from their goaltender, whoever that may be, and they need to stay disciplined. Sure, I’m saying this on the Kelowna side but watching them take mindless penalties makes it that much easier for the Rockets to put this away. Cole Linaker finally got his game going and I expect a big Game 6 from him. Every Rocket player looks poised to head to the next round and I thought the Royals would be the team to beat, but they’re looking a lot like Brandon did a year ago. We all know what happened after that….but lets not bring up the Final just yet.